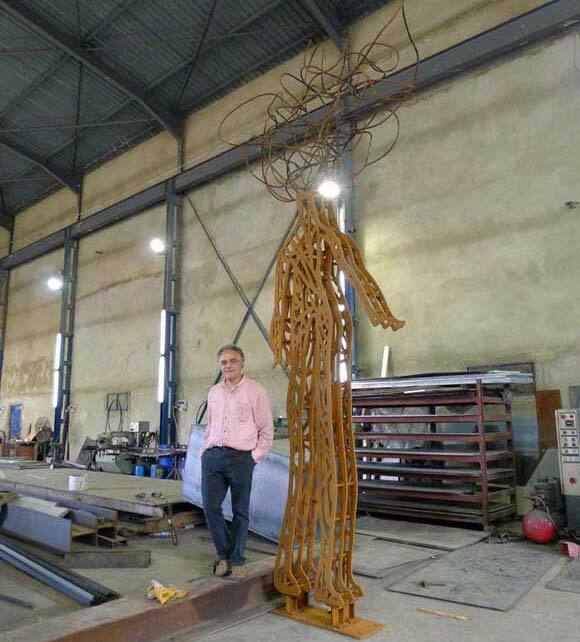 At Gebco Steel, Nahr el Ibrahim, on July 7th 2014, Nadim Karam unveiled two large-scale sculptures from his new “Stretching Thoughts” series. 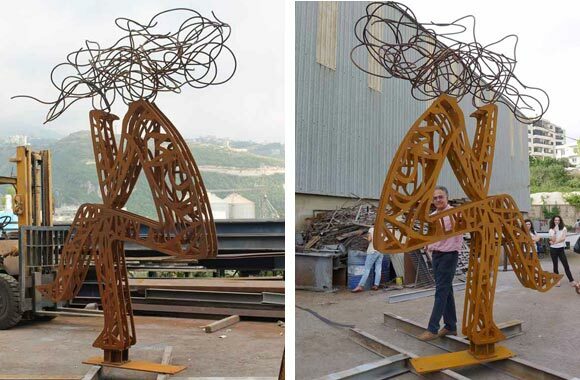 Developed by Nadim Karam & Atelier Hapsitus, the artworks will be exhibited at Jing An Sculpture Park as part of the Shanghai JISP Biennale 2014 from September 20th until November 20th 2014. “Stretching Thoughts” is a series of sculptures about the condition of the contemporary human mind, its connectivity to the world and the spread of ideas and creative energy beyond limits and borders. As notions of local space and boundaries are transforming, Stretching Thoughts embody the tangled web of human dreams and fantasies that seek ever-distant horizons. “Stretching Thoughts, standing” “Stretching Thoughts, seated” are both made of steel with a rusted finish. Their heights are respectively 4.85m and 3.52m. Nadim Karam’s consistent production of work across disciplines – painting, sculpture and public art – are optimistic acts of rebellion as well as affirmations of the power of creativity against the tedium, soullessness or terror that at one time or another afflict our lives and cities. He considers our cities as living organisms that we activate with our energy and creative output, furnishing the stories, memories and dreams that keep them alive. The artistic vocabulary he calls ‘urban toys’ consists of hundreds of animalesque/humanoid forms that have echoes of influences spanning from ancient hieroglyphics or cave paintings to modern manga, effectively forming a unique language that crosses linguistic and cultural barriers. His reference to them as ‘toys’ typifies his absurdist, whimsical approach and the mission he assigns his works; to intrigue, provoke or amuse. With Atelier Hapsitus, the pluri-disciplinary company he founded in Beirut, he has realized urban interventions internationally, both temporary and permanent, in cities as diverse as Melbourne, Prague, Dubai, Beirut, London and Nara, Japan, exploring the use of public art as an instrument of urban activation and regeneration. 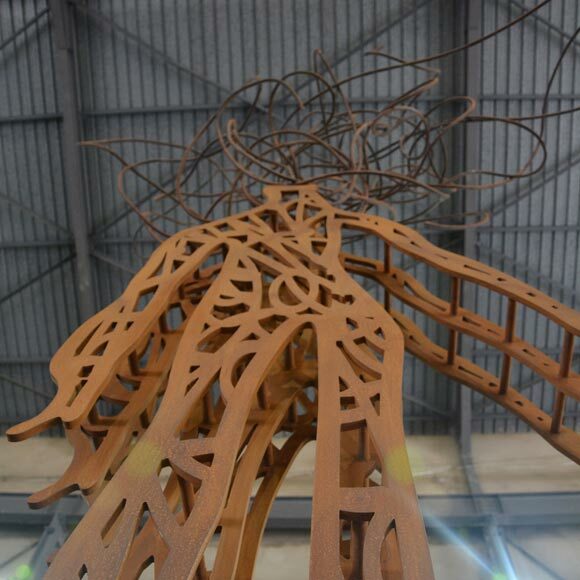 He received three Australian awards for his 2006 Victoria State commission ‘The Travellers’, a permanent work of ten giant sculptures that move daily at regular intervals on railways across a city bridge, telling the story of Australian immigrants through an urban clock of sculptures. In recent years, he has received international attention for his proposed project ‘The Cloud’, representing a radical new concept for public space inspired by the city of Dubai. Karam’s paintings and sculptures appear regularly in solo and group exhibitions worldwide. Publications on his work include ‘Stretching Thoughts’ (2014) ‘ The Cloud, the Desert and The Arabian Breeze’ (2007), ‘Urban Toys’ (2006) and ‘Voyage’ (2000), all published by Booth-­‐Clibborn Editions, London. Three Lebanese students awarded at the Omrania | CSBE Student Award 2014 Seventh Cycle.